Recently Rastogi et al have reported the infrared spectra of o-amino­benzonitrile in solid phase. As the compound was highly fluorescent, its Raman spectra could not be recorded and hence the assignments made by them could not be compared with the Raman data. 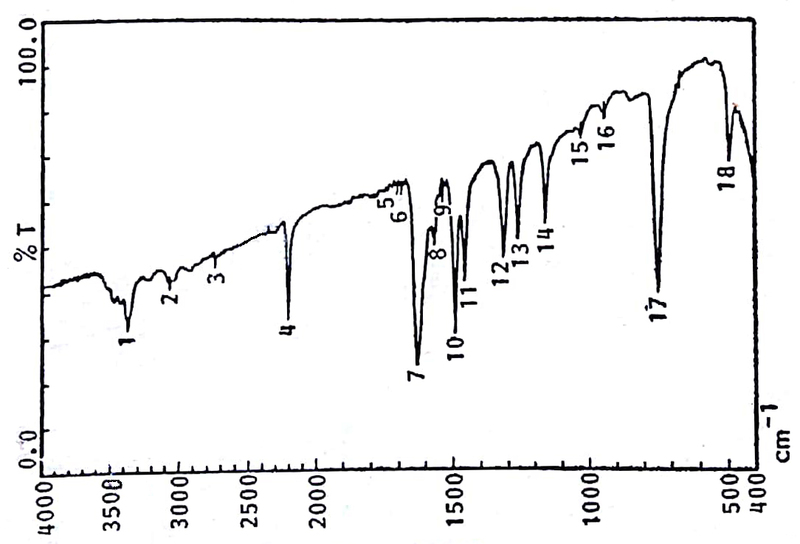 Therefore, in order to have a consistent interpretation of the vibrational frequencies of this molecule, we have recorded the IR spectrum of this compound in vapour phase and the results are reported in the present note. The IR spectrum was recorded with Jasco spectrophotometer model FTIR/7000 by warming the powder substance in a variable T cell and warming the KBr windows of the cell to avoid condensation of the gas. About 0.5 g of the substance (H2NC6H4CN; FW 118.14; mp 47-49°C; bp 267-268°C) was introduced in a 10 cm quartz cell with KBr windows, which was evacuated and sealed and temperature was controlled by two thermocouples. The IR spectrum is shown in fig 1. 1. 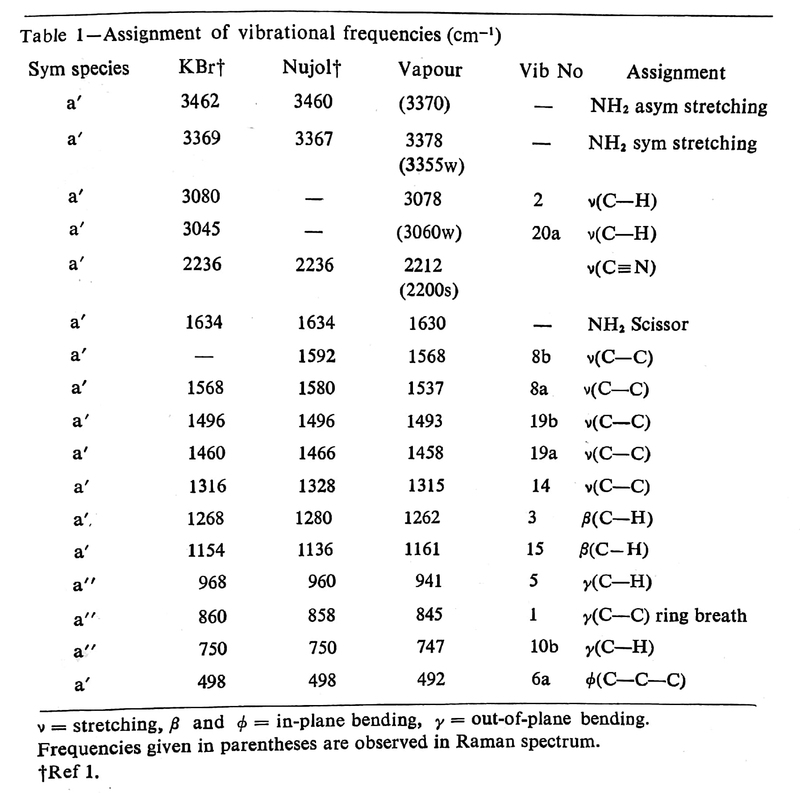 Rastogi V K, Mital H P, Sharma S N & Chattopadhyay S, Indian J Phys, 65B (1991) 356. 2. 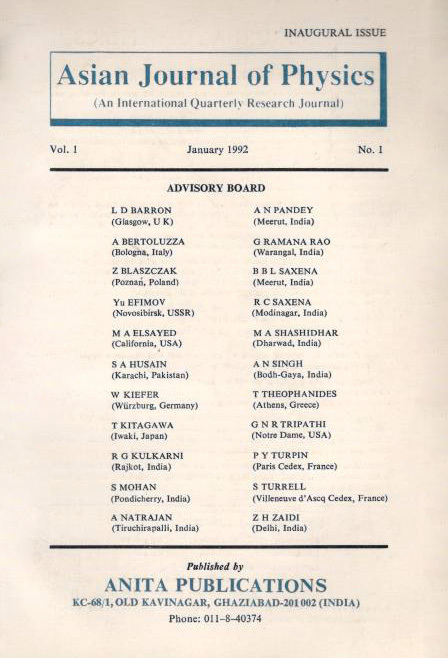 Rastogi V K, Jain D K and Sharma Y C, Asian JChem, 3 (1991) 113. 3. Rastogi V K, Mital H P, Sharma Y C & Bottura G, Procd XII Int conf on Raman spectroscopy, (John Wiley & Sons) 1990, p. 176.